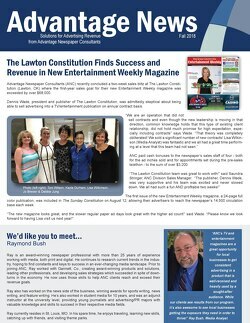 The Fall 2018 issue of Advantage News – Advantage Newspaper Consultants works with newspapers to sell TV/entertainment magazine and digital advertising with a 5-10 day sales blitz that includes training and cash bonuses. • Oklahoma market has tremendous success with newly launched Entertainment Weekly publication. • Midwestern papers with Forum Communications find TV/entertainment tabs are still relevant and profitable. • New digital ad revenue from a “squeezed in” Total Market Reach campaign in Connecticut. • Beta testing of Sales Advantage System has completed. Read what we have learned! • Get to know Media Analyst, Ray Bush. • Is the name of your TV/entertainment section telling the complete story? Think about it!